Nielsen released a report showing that Bing, Microsoft's search engine, has finally surpassed Yahoo. That makes Bing the number two search engine, behind Google. Yahoo has taken the three position. This does not apparently include the fact that Bing is powering most of Yahoo Search queries. Good news. I'm pulling for Bing. Hopefully we get Google to adjust their attitude a bit which stinks lately. I just find this funny being that Yahoo gave up on search by outsourcing the core search ranking algorithm and indexing to Bing and then Bing is eating their market share slowly and slowly. 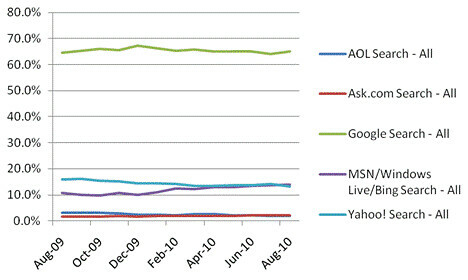 Plus, Bing is powering most of Yahoo's searches, so they get it on both ends. Good for Microsoft!